Brand new this year, our Hazelnut Crunch Egg is a cunchy blend of finely milled hazelnuts and our classic hazelnut ganache filling. Finished in a Swiss milk chocolate shell. 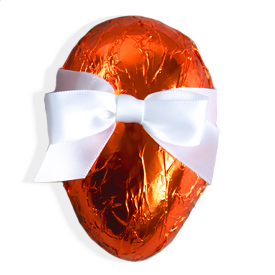 Dressed for Easter in festive orange foil and finished with a white bow. Milk Chocolate (Sugar, Cocoa Butter, Whole Milk Powder, Cocoa Mass, Lactose, Skim Milk Powder, Barley Malt Extract, Soy Lecithin, Vanilla), Sugar, Hazelnuts, Coconut Oil, Cocoa Butter.